The media fuss about recent suicides at China’s Foxconn company, an electronics manufacturer that supports, among others, Apple, has prompted a debate about the future. In particular, will rising wages drive tech firms elsewhere for cheap labor? The Wall Street Journal has a contemplative piece on this matter today. The article starts by mentioning the suicides at Foxconn’s factories and notes that there have now been several moves to elevate the wages of the workers there in order to try to relieve some of their stresses. These payments are going to be welcome, even if they’re borne of two slightly misplaced pieces of thinking–that the working conditions in another country must comply with the ethics and norms of your country, and that the suicides definitely represent a significant cluster. The latter of these two is disproved by some simple statistics, and even Steve Jobs himself has pointed this out, but the former has some traction–after all, it’s these factories that produce goods that let us live our particular lifestyles outside China. So there’s a degree of inevitability in rising wages in China, as companies like Apple react to pressure, which is a good thing. But the upshot of the wage increases may be an inevitable rise in the price of consumer electronics, as the money has to come from somewhere. An ethically motivated self-owned company may choose to take the hit from its profits, but the shareholders of a big commercial company almost certainly will choose to line their own pockets in preference to this option. And therein lies the other issue raised by this: A company that bumps its prices to pay its Chinese manufacturers more may well see its sales suffer, as the average consumer, who wants those “poor Chinese workers” to earn more also doesn’t want to pay more for his or her new gizmos. It’s a damned-if-you-do and damned-if-you-don’t problem. And so there maybe but one real option for Western electronics firms, faced with the prospect of rising wage bills in China–the currently preferred manufacturing base: Search for a different, cheaper place to make your goods. As the WSJ notes, the Asian region offers plenty of alternatives such as Vietnam, Indonesia, and India, the first two of which already have a substantial manufacturing base–exemplified by the recent completion of a notebook making plant in Vietnam for Compal (a provider for Dell and HP). 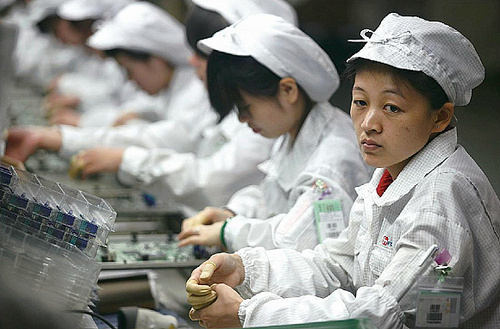 Foxconn also built a plant there in 2007 to offset rising wage prices in China … and we can speculate that some of those recent iPhone 4 leaks that popped up in Vietnam were achieved through Foxconn’s connections between the two nations. No big changes will happen overnight, of course: Thanks to billions of dollars in plant investments, the status quo has a huge inertia, so you’ll expect to see “Made in China” on your goods for a while yet before “Made in Vietnam” becomes a common sight. But this process can’t be indefinite, and hopping from one Eastern nation to another is a habit that’ll have to end eventually. Where will cheap electronics be made then? Update: Fresh from the controversies in the news, it looks like Foxconn’s executives are doing exactly as I suggested–they’re pursuing higher prices from their customers for their products. The company hopes to have new deals ironed out this month, according to a report in Reuters. This is only the start, of course–their customers will then probably pass on the costs to their own customers, even if the effects aren’t immediate.